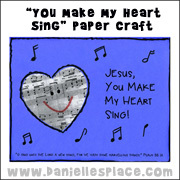 The following crafts and activities come from the Sunday School Lesson - Praise Him! from Psalm 148:5, 7-13 available on The Resource Room and as an instant download. 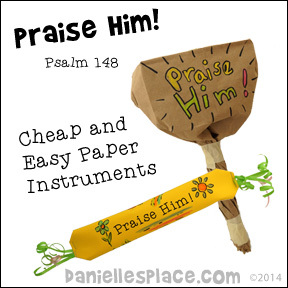 Children of all ages will love making these and using them to praise God. They are super easy and cost only pennies to make. Warning - these maracas are very loud! 1. Have your children decorate the bottom third of a paper lunch bag with markers, crayons, paint, or colored pencils. 2. Unfold the decorated paper bag and place another paper bag inside the decorated paper bag to give the maraca strength. 4. To finish, gather up the sides of the paper bags smoothing them out as you crinkle them up. Spread out the tops of the bags and blow into them to puff out the bottom of the bags. When you have a good shape twist the bottom of the bags to make the handle of the maraca. Use colorful tape such as duct tape or washi tape to decorate the handle and to keep it from unwinding. 1. Cut 2 1/2" inches off the ends of one giant craft stick using a Razor saw or Exacto knife. 2. Cut three masking tape pieces, 3-inches long. 4. Line up the 2 1/2" craft pieces at the end of a giant craft stick so that one piece is on the bottom and the other is on the top. 5. Wrap the other 3-inch piece of tape around all three craft stick pieces so that it covers the tape hanging from the end of the cut crafts sticks, but not the craft sticks. 6. 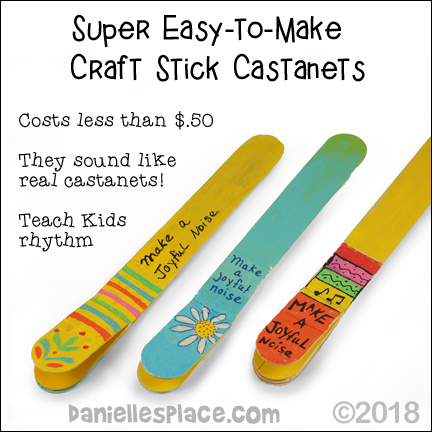 To finish paint the castanets with acrylic paint and decorate them with paint markers. These shakers are super easy to make and need no preparation. 2. When the child is done with his design roll up the paper into a tube. Stick tape down the entire side of the tube to keep it rolled up. 4. Let your child place a tablespoon of dried beans, rice, popcorn, etc. into the tube and then close the end just like you did the first end. I teach 2nd and 3rd grade Bible Class and each week I supplement with the resources from Danielle's Place! I have come to truly depend on the resources you offer on your website! Please keep up the GREAT work - you all don't realize just how many children/families lives you touch through your resources! THANK YOU! 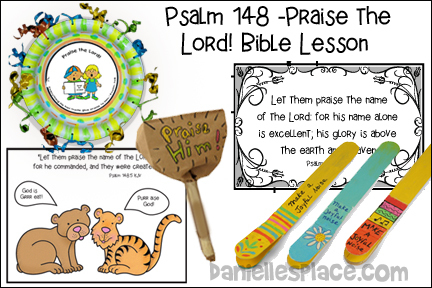 Children color pictures that illustrate Psalms 148:5 and 9-13. There are also pages in which they draw pictures to illustrate the parts of the verses. The bear says, "God is Grrr eat!" and the Tiger says, "Purr aise God!" 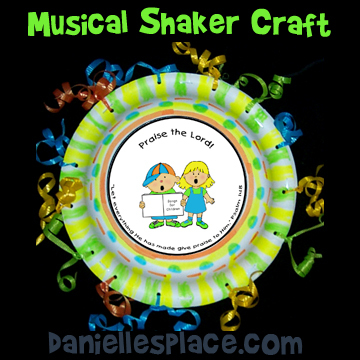 "Praise the Lord" Musical Shaker - A picture of two children singing praises with the verse "Let everything He has made give praise to Him!" around the edges is glued to a paper plate. 1. Before class prepare the shakers by placing 1/2 cup of rice on one plate. Place another plate on top and glue the plates together all the way around the edge with a low temperature glue gun. 2. Punch holes around the edge of the plates with a hole punch. 3. In class have your children decorate the shakers with highlighter markers and then tie pieces of ribbon through the holes. When they are done tying the ribbons use the edge of a pair of scissors to curl the ribbon.